Our Hotline Office is staffed Tuesdays & Thursdays from 9:00am to Noon. During this time, you are welcome to call in or come into the office and bring us a sample of the problem. If the office is closed, you can leave a message and a Master Gardener will return your call on the following Tuesday or Thursday. If you would like to submit a question electronically, please click on the link below and fill out the form. You may also attach up to three (3) digital photos pertaining to the problem. 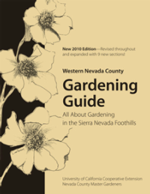 Or, visit the KNCO website http://www.knco.com - Click on "Listen Live"
Look for "Master Gardeners - The First Hour" and "Master Gardeners - The Second Hour"
The Master Gardeners of Nevada County give a wide variety of gardening and composting workshops throughout the year. During fall and winter months, most of our workshops are held at the Elk's Lodge in Grass Valley at 109 S. School Street. The majority of the workshops are held at the Demonstration Garden at 1036 W. Main Street, Grass Valley (on NID Business Center grounds). Check the calendar section on our Home Page to confirm location. All workshops are FREE and open to the public.